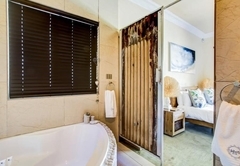 Shalom Leez is a property providing self catering in Panorama for up to 2 guests visiting the Northern Suburbs region. 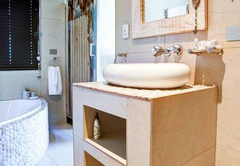 Shalom Leez offers accommodation for two guests in Panorama in the Northern Suburbs. The studio apartment is ideal for business or solo travelers. 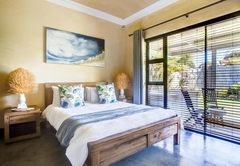 Guests have access to the garden, braai area and Jacuzzi. 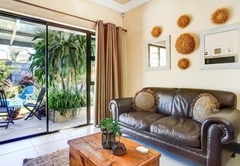 Shalom Leez is a self catering studio which is tastefully furnished and equipped. It has a double bed and an en-suite bathroom with a bath. The open plan living area is beautifully furnished and opens via sliding doors onto a patio. The kitchen at Shalom Leez is well equipped for self catering and has a bar counter with four bar stools which is ideal to enjoy a meal at. 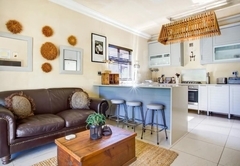 This upmarket Self-catering Apartment is ideally suited for Business-, Solol Travellers or Couples seeking the privacy of a stress free break away! 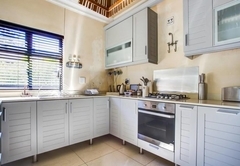 Enjoy the luxury of your gardeh, braai area and jacuzzi to relax in.. Tastefully furnished and equipped.